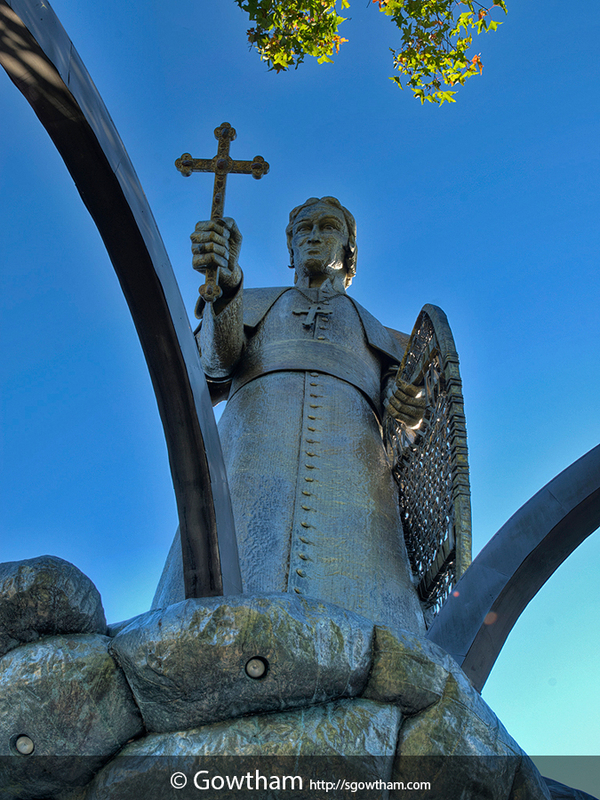 Born and ordained in Slovenia, Frederick Baraga was drawn to missionary work in North America and was the first bishop of the Diocese of Marquette (1853-1868). He learned the Indians’ languages and understood their desire to keep both their culture & their land. His best-known works, a dictionary and a grammar book of the Ojibwe language still in use today, were written at his mission in Assinins, across Keweenaw Bay. Records have it that he snowshoed 700 arduous miles each winter through the frozen wilderness beween Native American villages – and sleeping without even a tent. His life among the tribes of the upper Great Lakes region 150+ years ago inspired many affectionate names – The Snowshoe Priest, Shepherd of the Wilderness and Apostle of the Lakelands. The village shoring the Keweenaw/L’Anse Bay is named Baraga in his honor. The L’Anse-Lac Vieux Desert Trail – which crossed the interior of the Upper Peninsula of Michigan from L’Anse on the Keweenaw Bay to LAc Vieux Desert on the Wisconsin border. The trai was used in pre-historic times by the native Americans traveling to visit, hunt &/or trade. The trail was later used by fur traders, early surveyors and home-steaders. The L’Anse and Lac Vieux Desert bands of Chippewa Indians used this trail into the twentieth century. Many segments of this trail are unpaved and may now be accessed/traveled by modern automobiles.